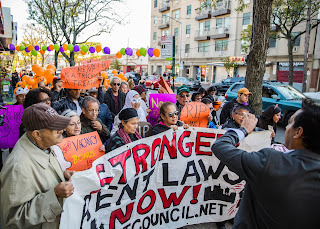 QUEENS, NEW YORK — More than 50 tenants in Halloween costumes, along with local community organizations and legal advocates will trick or treat at Senator Peralta’s office to ask for the passage of three bills to protect tenants from being priced out of NYC; S.3482 would repeal Vacancy Decontrol, S.6527 will reform Preferential Rent and S.1593 would repeal the Vacancy Bonus. Tenants are calling on Senator Peralta to make these bills top priorities of the Independent Democratic Conference (IDC) by getting four more of his colleges to sponsor the legislation and a commitment from Jeff Klein, the leader of the IDC to bring the bills to the floor at the start of the 2018 legislative session. Hundreds of postcards from constituents of the 13th State Senate district will be delivered to his office during the event.